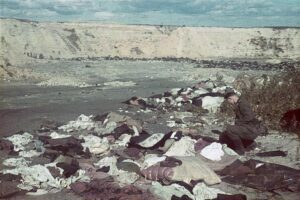 A German soldier looking through the piles of clothing and personal belongings at Babi Yar in October, 1941. Marianna Kiyanovska’s latest poetry collection Babyn Yar: In Voices (Kyiv: Dukh i Litera, 2017) seems to take us to the Nazi-occupied Kyiv of 1941. The Axis forces entered the city on September 19. By the end of September, 33,771 of Kyiv’s Jews had been executed. The voices of Kiyanovska’s poems tell the story of those ten days as if they were months, even years: time slows down, turns viscous, crackles like glass. In 1939, the Jewish population of Kyiv was at its historical peak, approaching a quarter of a million. The Nazi invasion led to a massive Jewish flight. On September 29th, 1941 the remaining Jews were ordered to show up to a designated spot with “documents, money and valuables, and also warm clothing, linen, etc.” A failure to follow the order could lead to getting shot, the pamphlets stated in German, Russian, and Ukrainian. Upon their arrival, they were led down the street to the lip of a ravine known as Babi Yar (“the Women’s Ravine”); there they were instructed to undress, their possessions seized from them. Naked, they were pushed along into the ravine and forced to lie down on top of the bodies of those shot right before them. Each person would then be shot in the neck. The survivors – of whom there were twenty-nine – recounted crawling from under the layers of corpses, digging out their way through the dirt that the Germans and their local collaborators used to cover the site of the execution. Thirty-three thousand murdered over two days – and less than thirty survivors. The orchestration of the massacre was orderly, precise. The death toll of the battle of Kyiv, which lasted seven weeks, was close to three quarters of a million, with over 600,000 killed on the Soviet side and 30,000 on the German. In the context of such a massive loss of life, the execution of the thirty-four thousand at Babyn Yar must have seemed like a relatively insignificant event. War reduces death to numbers of casualties, and quantities can be compared, weighed against one another. Yet it was the largest killing operation of a civilian population carried out by the Nazi regime to that date. Logistically speaking, the operation was also unparalleled in organization and scale. Nothing like this had been done before. It is usually thought that the people that came to the designated intersection of the Melnykova and Dorohozhytska streets on that morning did not expect to be killed. They didn’t even know they were headed for Babyn Yar, which is located almost a mile away from the intersection. At Nuremberg, one of the commanders of a Nazi death squad recalled that “up to the very moment of their execution, [the Jews] still believed in their resettlement, thanks to an extremely clever organization.” This makes Kiyanovska’s “voices” all the more uncanny: nearly all of them express an expectation that they will die. Some of the “voices” are driven to the grave-like ravine by a sense of destiny; others seek premature death in the streets deliberately, in a desperate attempt to regain control over their hopeless predicament. It is as if Kiyanovska’s own knowledge – as an author writing in 2016 – gets passed on, illicitly, to the Kyiv Jews of the 1941, whose voices she attempts to summon. The voices know more than the people whose voices they are. Babyn Yar was first used as a mass killing site on September 29th, 1941. Over the two years of Nazi occupation of Kyiv, the ravine continued being used as a place of execution of political dissidents, prisoners of war, psychiatric patients, and various “undesirables” of all ethnicities. By some estimates, as many as 120,000 people had been murdered there. Yet in Babyn Yar, the voices are almost exclusively those of the Jewish people, taking us back to the first massacre. One of the most powerful devices that the poet uses is that of giving names: as in a spiritual séance, many of the poems end with the “voice” naming its possessor. The impression of directness this creates further amplifies the poems’ emotional pitch: I am this person, and I have spoken. Like a signature on a painting, it redirects the authorship back to the still-living body whose voice speaks the words that form a message. The message – a sudden burst of illumination reaching us from the past to say “I lived” – is a poem. Babyn Yar is a controversial book. It raises questions about what it means to write witness-like poetry without bearing witness to the historical events the poems are about; about the distinction between giving voice to victims, and speaking for them; about cultural appropriation, historical projection, and the right to represent another; about a choice of language; about tone. In a recent review, a prominent Ukrainian poet Serhiy Zhadan says that the book is about “the mechanisms that make it possible for the strangers’ voices, the voices of many people, to sound out through the poet, through her lines.” These mechanisms, his essay suggests, have something to do with the indiscriminateness of “hearing.” Why did the author write about the tragedy that does not seem to concern her? Zhadan asks. His answer is that all the voices exist “within the same space”; one can’t pick and choose between the voices of the victims of Holodomor and the victims of Holocaust. One can’t hear “one’s own dead,” while blocking out the others. The parallel helps make sense of the helplessness of Kiyanovska’s “voices,” of their persistent conviction that there’s no exit, no escape. This type of attitude, known to psychologists as learned helplessness, arises when a subject is repeatedly exposed to aversive stimuli he or she is unable to avoid. It helps explain why uprisings were so rare in the concentration camps. It also helps account for the passivity and a sense of resignation that the victims of routine domestic and sexual abuse so often exhibit. Most of those who came to Babyn Yar on September 29th, with kids and warm clothes, discovered that they were about to get killed after they’d arrived. They may well have been apprehensive and pessimistic about the future, but they did not go there expecting to die. By contrast, those that came to the Babyn Yar in the following months and years usually knew where they were going and why. Often, the victims of those later Nazi crimes would expect death, wait for it. In having this expectation, they resembled the peasants trapped in their villages during the state-orchestrated famine of 1932-1933. Death by starvation is slow. As one watches one’s family and community slowly die out, the future, literally, closes down. If an alternative future – a narrow escape path – suddenly opens up, one can no longer even notice it. One’s destination – like the destination of those driven to the ravine – is death. Serhiy Zhadan’s conclusion is hopeful: he sees Babyn Yar as a “freeing” of voices, and with it, “the ordering memory, and the ordering conscience.” But whose memory, and whose conscience? Whom are we freeing: the voices, ourselves? What are we freeing (them, us?) from, and what is this freedom for? How do we ensure that the memories we recover and the conscience we cultivate is not yet another mechanism of self-congratulatory insulation from genuine responsibility? And what is this protective circle of the “we” each of us tries to build? Whom does it include? Who has a right to be included? Answering these questions is important, and it is also hard. No matter what one says, one’s answer will raise further questions – including, perhaps, questions about the very subject who raises the questions. These poems, too, are answers. Yet we must keep asking the questions they are answers to, and questions about them – as answers. We (I, you) must keep asking and asking, and listen beyond our own anxious and hopeful echo.